Thank you for choosing Versi-Foam insulation for your insulation project! Everything you need to get started with your spray insulation is included in your Versi-Foam kit. If you need further instructions than the ones below, please see your instruction guide document provided in your Versi-foam kit. For the best spray pattern, it is best to stand 18 to 24 inches away from your target.With Versi-Foam spray systems, you can control the velocity of the chemical flow by how far you pull the trigger of our patented U-Control dispensing gun. There’s no reason to be surprised by the density of your spray foam kits! Initially, pull the trigger all the way back, and then ease it forward until you find the position that gives you the best results for your foam insulation project. Spray a strip around the perimeter of the spray installation area you wish to cover. With a back-and-forth motion of your wrist, fill in the area from top to bottom with Versi-Foam.The faster you move your wrist, the thinner the layer of foam. The foam will expand six times its original liquid volume, so be careful not to apply too much in one pass. In just 30-45 seconds, the Versi-Foam spray will be tack-free to touch! Looking for a heavier spray installation than the first layer? Apply another layer of foam in a snap. If your application requires a thickness in excess of 2 inch, we recommend applying it in multiple passes. Applying too much foam in one pass may result in an uneven surface, and the foam may sag before curing completely. If you choose the high-density foam found in the Versi-Foam System 10 and 33, and you need to spray apply the foam to a surface, we strongly recommend the purchase of the fan tip accessory to achieve an acceptable spray pattern. To caulk large gaps with a spray kit, simply run a bead of Versi-Foam into the cavity. Place the tip of the spray nozzle at the edge of the cavity and slowly pull the trigger. Remember that the foam will expand six times its original liquid volume, so take your time with the initial application -You can always add more foam to fill the gap as needed once it has fully expanded. Dispense too much foam? Don’t worry! You can trim away with excess with a sharp knife. Polyurethane foam is formed through an exothermic reaction. That means that it generates heat as it solidifies. Polyurethane foam is also an excellent insulation material for any construction or home project. If too much spray foam is dispensed into a large cavity or a large hole, the foam around the outside of the space will insulate the heat generated from the core of the cavity. foam to the top of it. 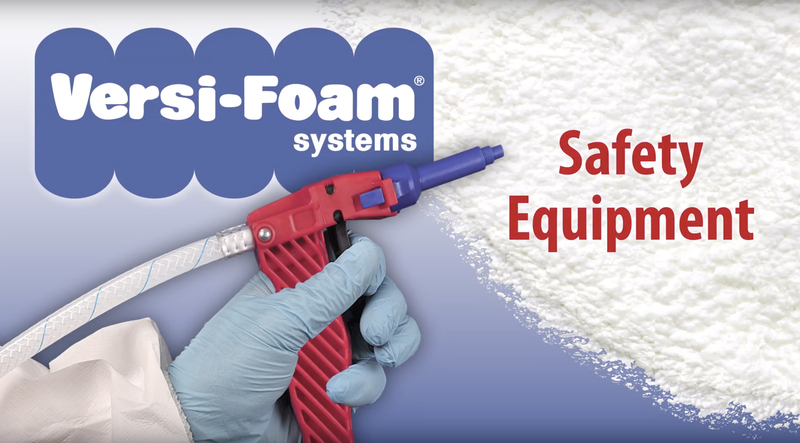 Good quality foam is dependent on one-to-one ratio dispensing. The easiest way to determine that you have good ratio is to observe the stream of chemicals coming out of the gun before they pass through the mixing nozzle. To do this, remove the nozzle from the gun and point the gun into a waste container. Pull the trigger and observe the chemical streams. You should see two chemical streams crossing over each other and flowing at equal velocity. Know that the "A" component is light brown in color and the "B" component is white or nearly clear in color. If you see more "A" chemical flowing than "B" chemical, your foam is probably darker in color and may have a crunchy, glassy surface. First check the temperature strip - is the chemical cold? Cold chemicals will result in foam that is "A" component rich. If the temperature strip indicator is in the blue section, warm the tanks, shake them vigorously, and check the chemical flow again. If the temperature strip indicates the mid-green section, meaning the temperature is right for dispensing, then check the "B" component tank. Confirm it is not empty and that the valve is turned all the way on. If all of these things seem to be right, contact us for further action. If you see more "B" component than "A" component, your foam is probably whiter in color with a spongy surface texture. First check the temperature sensing strip - is it indicating in the red section? Chemicals that are too warm often result in foam that is "B" component rich. Cool the chemicals, shake the tanks vigorously and check the chemical flow again. If the temperature seems right, check the "A" component tank. Confirm that it is not empty and that the valve is turned all the way on. When was the last time you used the system? We strongly recommend that the gun is dispensed a minimum of once every week, more often in humid climates. Failure to do so will result in a blockage on the "A" component side of the gun. If there is no chemical flow, the gun/hose assembly will need to be replaced. Contact your distributor for more information. If you do not seem to be getting acceptable flow from both components, this would indicate a lack of pressure. The only known cause for both tanks to lose pressure is if the kit was used while lying on its side. The chemical tanks are similar to aerosol cans. If you dispense foam while they are on their side, the propellant escapes through the hose and the pressure is lost. There is no remedy for this. You can only prevent this from happening by keeping the systems in their upright position during use. Ideal chemical temperature is between 65° F and 90° F. Versi-Foam is equipped with a temperature sensing strip that helps you determine that the chemical temperature is within the ideal range. The temperature sensing strip shows three colors - blue indicating that the chemicals are too cold, red indicating that the chemicals are too warm and green indicating that the chemicals are within the ideal temperature range. Perfect temperature will indicate in the center of the green indicator. If the chemicals are too cold, you are probably dispensing foam that is "A" component rich. It will be darker in color and may have a crunchy, glassy surface texture. Warm them up, shake the tanks vigorously and check the chemical flow from the face of the gun. If the chemicals are too warm, you are probably dispensing foam that is "B" component rich. It will be whiter in color and have a spongy surface texture. Cool them down, shake the tanks vigorously and check the chemical flow from the face of the gun. Ideal surface temperature is between 65° F and 90° F.
Surfaces that are colder will result in reduced yield. This is caused by the cold surface extracting the heat from the exothermic reaction resulting in a reduced rise, thus a reduced yield. If the surface is 40° or colder, the exotherm may also cause condensation, which would be like spraying foam onto a wet surface, therefore, the foam may not adhere to the surface. The only way to determine if this will happen is to do a test patch. If the foam sticks to the cold surface, spray the least thickness possible to simply raise the surface temperature to a level that would be closer to ideal temperatures. Allow that layer to cure. Then add the desired thickness to achieve your R-factor. Foam that dispenses soft is usually also whiter in color. This is an indication that you dispensed more "B" component than "A" component. Click on Checking the Gun for Proper Function for procedures to determine that this is the case and how to remedy the situation. 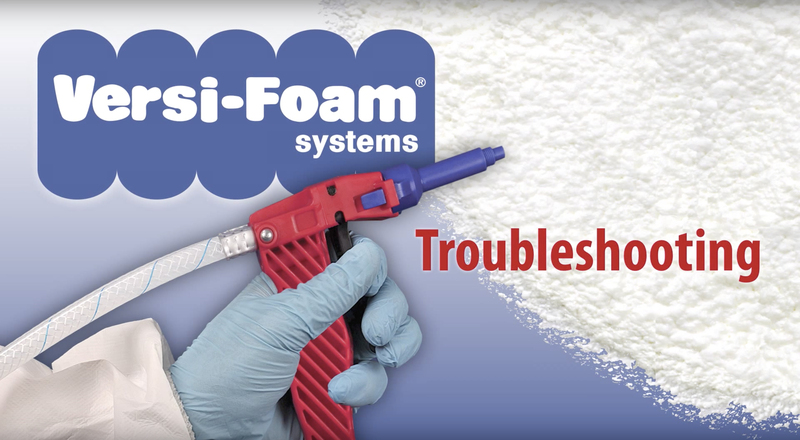 Also view the Troubleshooting Video to see what this foam looks like and learn how to solve the problem. Foam that is very white in color will also have a soft surface texture. In extreme cases, it may appear to liquefy, or melt shortly after it is dispensed. This is an indication that you have dispensed more "B" chemical than "A" chemical, or in those extreme cases, no "A" chemical at all. Click on Checking the Gun for Proper Function for procedures to determine that this is the case, and how to remedy the situation. Also view the Troubleshooting Video to see what this foam actually looks like and how to solve the problem. Foam that has a crunchy or friable surface texture will most likely be darker in color that it should be. This is an indication that you are dispensing more "A" chemical than "B" chemical. Click on Checking the Gun for Proper Function for procedures to confirm this and find out how to remedy the situation. Also view the Troubleshooting Video to see what this foam actually looks like and see how to solve the problem. Foam that is darker in color usually also has a crunchy or friable surface texture. This is an indication that you are dispensing more "A" component than "B" component. Click on Checking the Gun for Proper Function for procedures to confirm this and find out how to remedy the situation. Also view the Troubleshooting Video to see what this foam actually looks like and see how to solve the problem. Most often when there is only one chemical coming out of the gun, it will be the "B" component, or whiter chemical. This is usually caused by not using the gun on a regular basis, causing blocking on one side of the gun. The "A" component is very sensitive to humidity. When exposed (and it can be exposed through the hoses), it forms small dark crystal that form on the inner side of the hoses or in the small spaces between the inner workings of the dispensing gun. If you use the gun a MINIMUM of once per week (even more often in humid climates), the constant flow of chemical will eliminate these crystals from forming. If the gun and hose assembly sits for too long, these crystals form, and when you pull the trigger the next time, they either create a blockage or completely freeze up the inner works. To prevent this from happening, USE THE GUN AT LEAST ONCE PER WEEK (more often in humid climates). To fix the problem, you will need to purchase a new gun and hose assembly. See the Troubleshooting Video for the procedure on how to change the gun and hose assembly. Cleanup of "B" component can be accomplished using soap and water, however, get it while it is still in the liquid state. If only "A" component is coming out, and this very rarely happens, something has occurred to freeze up the "B" component side of the gun. Most likely, the gun and hose assembly had been sitting much too long between applications. You will need to purchase a new gun and hose assembly and install it on the kit (view the Troubleshooting Video for the procedure). Cleanup of "A" component is very tricky. DO NOT USE WATER TO CLEAN UP THE "A" COMPONENT CHEMICAL. Be sure to wear nitril or butyl rubber gloves and proper respiratory equipment. For a small amount of chemical, saturate a rag with dish soap and wipe it up. Be sure to do this while the chemical is still liquid. And be aware that there will most likely be a stain. For larger amounts of chemical, refer to the Material Safety Data Sheet, Section 6 for instructions to deal with a chemical spill. To be sure that both chemicals are dispensing from the gun PRIOR to your application, always do a test shot into a waste container prior to actually dispensing the foam. If the resulting shot looks suspicious, follow the procedure in Checking the Gun for Proper Function and/or view the troubleshooting video for step by step instructions. For pricing please contact us to find the distributor who sells in your area. Where can Versi-Foam products be purchased? We service our customers through a network of distributors. To find the distributor who sells in your area, click here to search online or call us at 1-800-657-0702 or email us at sales@www.rhhfoamsystems.com. How does closed cell Versi-Foam compare to fiberglass and cellulose? Versi-Foam® has a approximately twice the R value, provides an airtight thermal seal, resists moisture and mold, seals hard to insulate areas, adds structural stability, and more – leading to significant energy savings and an overall better return on investment. More “traditional” insulating materials such as fiberglass and cellulose are less expensive upfront; however Versi-Foam® offers the better value in the long run. What are the differences between Open and Closed Cell Foam? Closed cell foam has better thermal properties. The R-value with closed cell foam is typically higher per inch. Closed cell foam prevents moisture and is resistant to mold. Open cell foam allows vapor to pass through and is not as durable. The appeal of open cell foam is its high expansion rate. Less foam is needed which makes it more cost effective. In the presence of moisture, the open cell foam will dissipate the moisture quicker than closed cell foam. 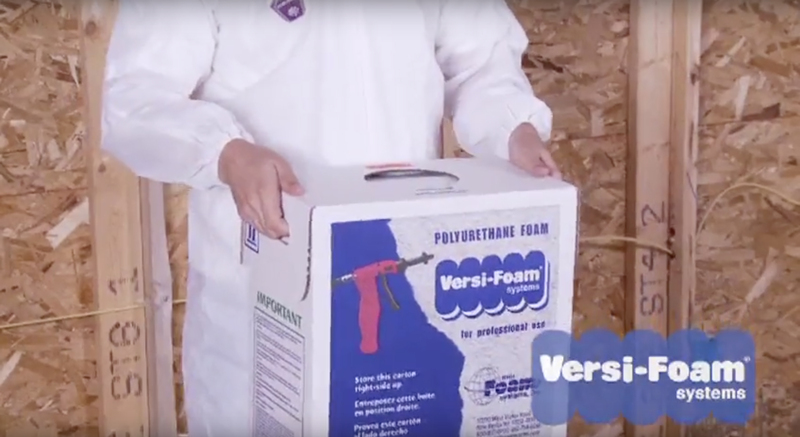 What sets Versi-Foam apart from other low-pressure spray foam kits? 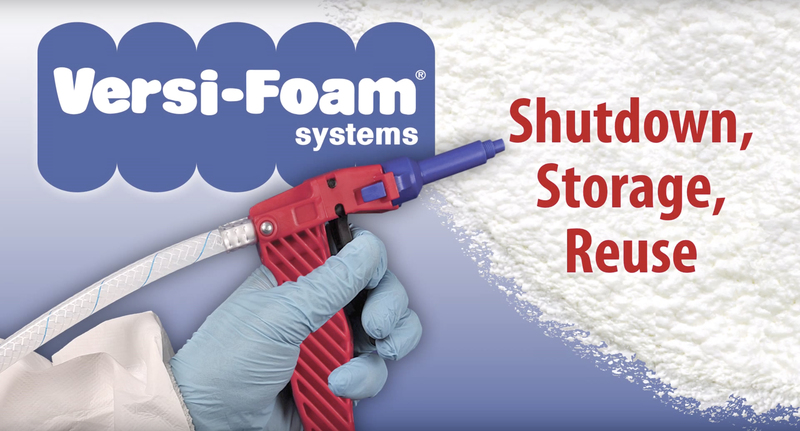 Our patented U-Control dispensing gun provides the user complete control of how much foam to dispense by how hard you pull the trigger on the applicator. The gun allows you to spray foam at a rate of approximately 6 pounds per minute, or so slowly that you can write your name with it. It is the key to a consistent spray pattern and surface texture. The metered spray pattern saves material and clean up time. All Versi-Foam® Closed Cell Systems are water-resistant, but not waterproof. Minimal exposure to moisture will not affect these foams, however the foam may be compromised if submerged under water for a period of time. Conversely, the Open Cell Systems will absorb and retain water if exposed. Therefore the Open Cell Systems should not be used in areas where moisture may be present. Temperature is key in producing good quality foam. For the majority of the closed-cell Versi-Foam® systems, ideal yield/expansion and adhesion will result when the substrate and chemical temperatures range between 65°F and 90°F. Medium and large sized Versi-Foam® Systems come complete with temperature strips indicating chemical temperature. Consult the operating instructions for specific temperature requirements. Can Versi-Foam be left uncovered within a residential application? By residential codes, you are required to cover polyurethane foam with a 15 minute thermal barrier. A ½ inch of drywall is the most commonly used. For uninhabited areas, such as attics and crawlspaces that are accessed for maintenance only (not used for storage) you may use an ignition barrier in lieu of a thermal barrier. A thermal or ignition barrier is not required within a sill plate or header as long as the foam is not installed in excess thickness of 3.25". Contact RHH Foam Systems for recommended thermal & ignition barrier products. Does a vapor barrier still need to be installed? A vapor retarder of some degree is required on the warm side of the building assembly. A vapor barrier is defined as a Class I vapor retarder (perm rating less than 0.1) and can be achieved with sheet polyethylene (Visqueen). Versi-Foam closed cell foams will achieve a Class III (1< perm rating <10) vapor retarder rating. Building codes call out for different vapor retarder requirements (Class I, II or III) depending on the region of the country. Consult your local codes as to which level of vapor retarder is required in your area. Do the kits have to be used the same day they're opened? Only the System I kits need to be used same day. All larger systems may be shut down and re-used again. If the kit will be used infrequently, a weekly maintenance routine is needed to prevent gun and hose blockage. See the Operating Instructions for weekly maintenance instructions. Can Versi-Foam be injected into a closed wall cavity? Application to existing closed walls is not recommended due to the pressure created by expansion. Damage to drywall and plaster will occur if the cavities are overfilled. The Department of Transportation forbids refilling tanks. Once completely emptied the tanks should be disposed of as normal industrial waste. A sanitary land fill is recommended. Can Versi-Foam products be used over PEX piping? PEX piping is comprised of a highly-cross linked polyethylene (thermoplastic) material. PEX piping is chemical resistant and will not adversely react with Versi-Foam products. Thermoplastics, such as PEX, when heated in excess of 200 degrees Fahrenheit, could potentially melt. Versi-Foam® generates heat as it cures and we strongly recommend that you dispense no more than two inches in one application. Allow each layer to cure, and add foam to the top of it. One layer of foam will bond completely to the next. Applying the foam in excess thickness of what is recommended could result in temperatures exceeding the ratings of the PEX tubing and possibly melting could occur. Can Versi-Foam products be used over cPVC piping? In the past there have been many questions as to whether SPF will corode cPVC piping over time. Two studies have been done and the end result has been that there was no environmental stress cracking of the cPVC when it was insulated with spray polyurethane foam. The first study evaluated the chemical compatibility and simple thermal compatibility on unpressurized pipe and fittings between a wide range of SPF products (low density, medium density, and one component foam). This testing demonstrated that no environmental stress cracking of the cPVC is caused by the SPF products tested. The second study evaluated more extensively the effects of exothermic temperatures from both low density and medium density when applied to a variety of cPVC pipe diameters and thicknesses. This study shows that exothermic heating of pressurized cPVC pipes should not be an issue if the suppliers low density foam is applied 6" or less per pass, and medium density is applied at 2" or less per pass. Are there any health hazards associated with Versi-Foam? Versi-Foam® does not contain any urea formaldehyde, VOC's, CFC's or Penta-BDE's. The use of proper Personal Protective Equipment (PPE) is required during application. Please see the MSDS and Operating Instructions for PPE guidelines.